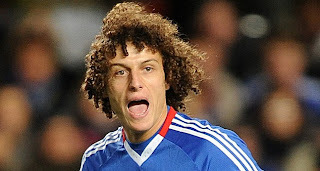 Barcelona are ready to make a shock £27.5million raid for Chelsea defender David Luiz - just five months after he joined the Blues for £21.3m. The Brazilian, signed from Benfica, has indicated he might listen to an offer from Barca, but only if Chelsea give their blessing. Luiz, 24, has made a big impression in his 12 Premier League outings, scoring twice as he helped the Stamford Bridge club finish runners-up. Barca boss Pep Guardiola is desperate for a new central defender as 33-year-old skipper Carles Puyol is struggling with a long-term left knee problem. Guardiola has asked sporting director Andoni Zubizarreta to follow up on a meeting between Barca president Sandro Rosell and Luiz's agent Giuliano Bertolucci in Brazil.Luiz joined Chelsea at the same time as Fernando Torres and has already formed a promising partnership with England skipper John Terry.